Striking the perfect balance of manual vs. automated customer engagement can be difficult. A fully-automated solution typically leads to copy errors, impersonal emails, and poor response rates, while a fully-manual solution is inefficient and difficult to manage. With our new Conversations feature, you can now create rules that auto-schedule conversations at the right times. You can even review scheduled conversations, make manual edits, and start 1-1 or group conversations directly from Vitally. Let's dig in! You can send emails to accounts in Vitally via Gmail and Intercom. If you currently have either of those integrations enabled in your Vitally account, you must disable and reenable the integration in Vitally to give us permission to send emails on your behalf. Ok, on to the new features! 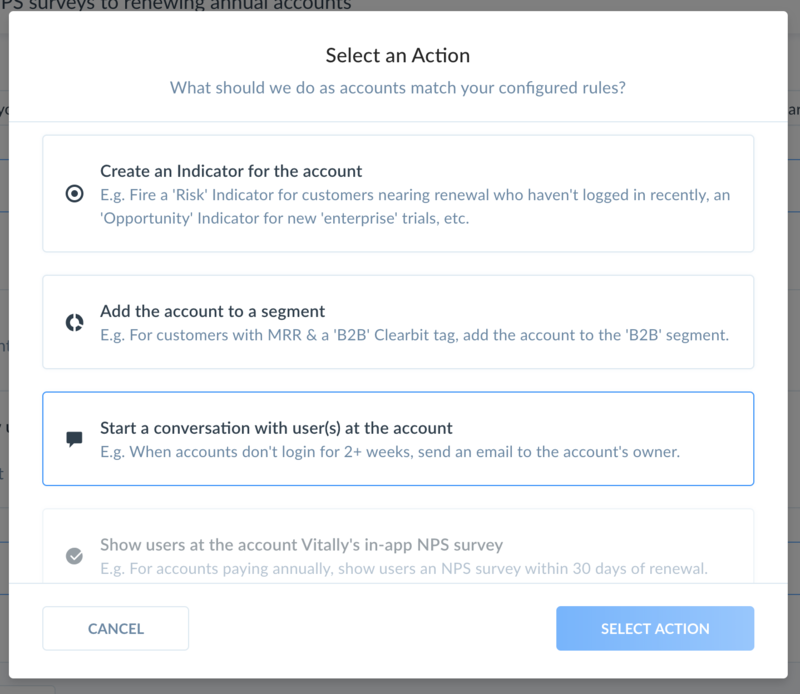 First, in our Rules feature, you'll see a new Action you can auto-run as accounts match your rules: "Start a conversation with user(s) at the account". Sender + channel: Choose between Intercom or Gmail. Note that only users with the integration enabled are displayed. Auto-send from the account's CSM: If this option is selected, we'll automatically send the message from the account's CSM when possible! Audience: When an account matches your rules, we can start a conversation with just the account's owner, all users at the account, or specific users that match additional rules you can define. Delay: Conversations can also be scheduled to start on a delay. This delay gives your team time to review pending conversations and make any changes needed (more on that below). As your conversations get auto-created by rules, rather than sending the conversation immediately, we instead create a "pending" conversation using the delay you configure. To view your pending conversations, simply navigate to the (new) Conversations->Pending view. As you review conversations, if you'd like to tweak the message prior to the user receiving it, simply click the Edit icon. 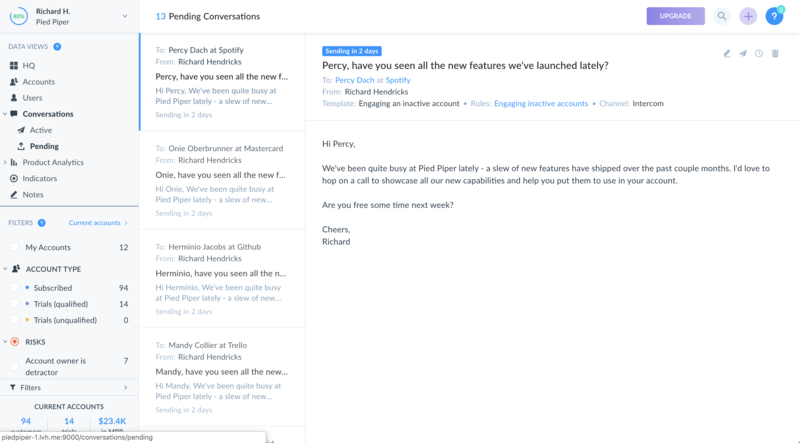 The perfect communication strategy balances automated with direct engagement, which is why you can also now start direct conversations with specific users or accounts! To do so, when browsing accounts or users, simply select those you'd like to message and click the Start a Conversation icon in the top right. When starting a direct conversation, you have access to the same set of features as described above: e.g. templates, specific send dates, dynamic senders, etc. ☝️ That form at the bottom of conversations up there - that lets you directly reply to the conversation from within Vitally. That way, you no longer need to jump to another tool to respond to a conversation you are already looking at in Vitally! As mentioned above, you can now create reusable message templates in Vitally, complete with user, account, and CSM variables that get auto-replaced with the user/account/CSM associated to the conversation. No one wants an email at 3AM - it's often a sign that the email is automated (or that the sender has insomnia). To ensure conversations you start are sent at reasonable times, you can now define a custom sending window for each day of the week. If configured, we'll only send emails during the window configured for that day. In your profile settings, you can now define a signature that we'll auto-add to all messages sent from your account. We also added new triggers to our Zapier integration - one for new NPS responses (see our previous release) and another for new notes created within Vitally. We've updated our Intercom integration and added support for syncing your Intercom product events into Vitally! When configured, we'll listen for new product events tracked via Intercom and will auto-create them in Vitally associated to the correct user/account. We also now have support to render your revenue in your home currency. To adjust your currency from the default USD, simply navigate to your account's Settings and select your desired currency. We've extended our Views feature to work with Users. Additionally, default Views are now set directly on your Vitally user account and are no longer applied to all users, so everyone can now have their own default View! Similarly, we've extended our "Custom Traits" feature to also work with Users. This allows you to add new traits to your users (e.g. phone number, job role, etc). Like all traits in Vitally, you can sort and filter by these new custom traits. 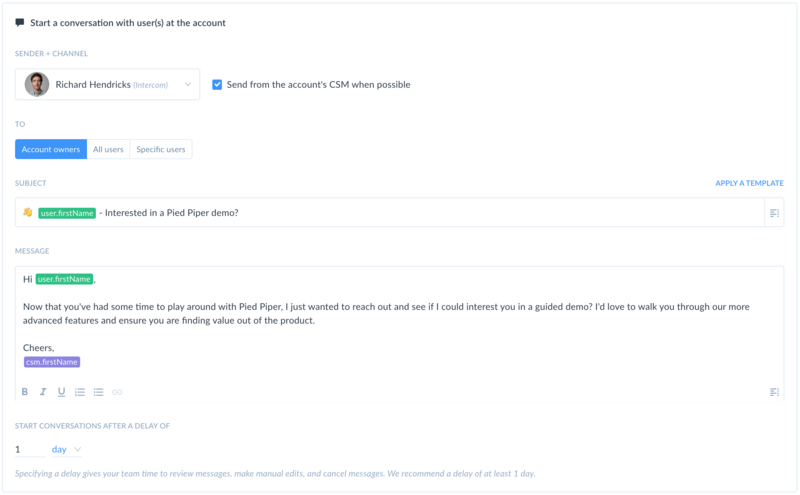 Along those lines, since our new messaging functionality can dynamically send emails from each account's CSM, we thought it'd be useful to allow you to add CSM-specific details to each message. Thus, we've also extended our "Custom Traits" feature to work for your team profiles! For example, let's say you want to auto-send conversations from the CSM, and you'd like to have each message include a Calendly link for the sender at the end of that message. To do so, just create a new Custom Trait for your team and then have your team members update their traits to include that link. You'll then be able to reference that trait when defining your templates and messages. Lastly, you can also now identify specific events as "background" events. "Background" events are non-product events - we track them like we do for all events, but we ignore them when updating default product metrics like the account's last seen timestamp. Stay updated on future posts and join our community of B2B leaders focused on building a data-backed, successful customer base.